CBD Critical Cure is the outcome of a joint venture of Barney's Farm and the CBD Crew. As the name of this variety already suggests, it is one with a high CBD level for medical purposes. Great natural pain-killer with a CBD level of 8% and an earthy flavor with a hint of sweetness. This small plant delivers about 600g/m² after only 55-60 days of flowering. CBD Critical Cure is the result of a collaboration of Barney's Farm and the CBD Crew. As the name of this strain implies, it has a high CBD level and is intended for medical users. 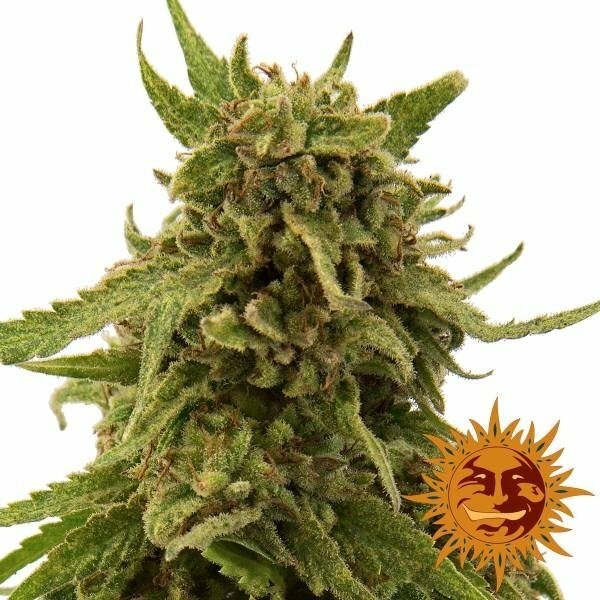 The guys at Barney's Farm pollinated a female CBD-rich strain contributed by the CBD Crew with their Critical Kush and thereby created a small plant with a short flowering time and high potency. CBD Critical Cure is the perfect contender for growers with restricted space and a slight deficit in regards to the virtue of patience. The plants stay at a modest height of only 90-100 cm and require only 55-60 days of flowering to develop very dense and extremely resinous flower clusters. In an outdoor grow the plants finish flowering at the end of September. At the end of the maturing process the plants have taken on a beautiful dark red hue and exude a pleasant earthy aroma with a subtle touch of sweetness - and the taste of the smoke is equally enjoyable. Reared indoors, the plants bring about 600g/m² to the scale - and CBD Critical Cure is not stingy when it comes to cannabinoids. With a THC level of only 5-6% and 8+% of CBD this weed qualifies as a great natural pain-killer and muscle relaxant, but without nailing your buttock to the couch. 3/5 de germées. Puis par la suite une triso mais vraiment triso c'est déclarer sur les trois. Résultat: plus que 2 plantes en croissance... Rrr pour le prix, je suis vraiment déçu. Ça fait chère le prix de revient pour 2 graine. Je ne recommande en aucun cas si vous êtes à la recherche d'une herbe avec un taux "important" de CBD. Passez votre chemin.